DVD to 3GP Suite is a professional 3GP suite conversion program included by DVD to 3GP Converter for Mac and 3GP Converter for Mac to rip DVDs to 3GP and convert videos to 3GP videos for playback on all sorts of 3GP mobile phones. DVD to 3GP suite for Mac has various useful features and it lets you set video brightness, contrast, saturation, select DVD subtitle and audio track, trim DVD and video, and merge multiple files into one file and so on. Rip DVDs to 3GP and convert videos to 3GP videos for all kinds of different brands of cell phones on Mac OS X. Allow you to merge and convert more than one DVD title (chapter) or video file in to one file. Preview your DVDs and video files before conversion to adjust the output quality. To watch your DVD movies and video files on your 3GP cell phones with 3GP converter suite for Mac is just a few easy clicks! 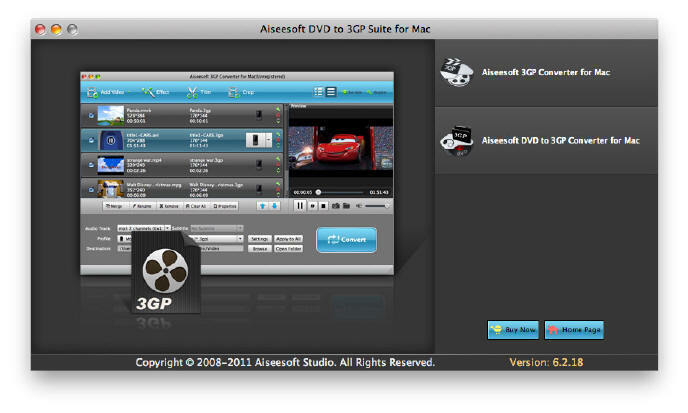 Why Choose DVD to 3GP Suite for Mac?